Nothing warms up the body like a spicy and hot soup during chilly weather! 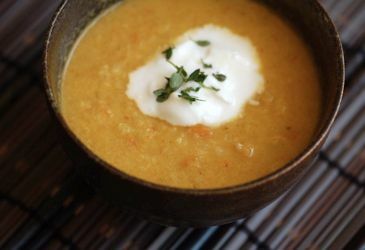 This is an unusually spicy and full-flavored cauliflower soup; if necessary, adjust the pungent spices to your comfort level. 1. Heat the olive oil in a heavy-bottomed soup pot. Add the onion, carrot, coriander seeds, cumin seeds, chile powder, turmeric, chile flakes, salt, and pepper and cook, stirring often, over medium heat. 2. When very soft but not browned, add the cilantro sprigs, cauliflower, chicken broth, and water. Raise the heat and bring to a boil, stirring occasionally. Reduce the heat to a simmer and cook until the cauliflower is very tender, about 30 minutes. 3. Stir vigorously with a spoon or whisk to coarsely purée the soup. You may need to add more broth or water to thin the soup if it is too thick. 4. Taste, adjust the seasoning if necessary, and serve hot. Garnish each serving with yogurt, cilantro or mint, and a squeeze of lime juice. For a richer soup, use all chicken broth. For a lighter, vegetarian soup, use all water.